This page reviews the practicality of various renewable forms of domestic energy generation and storage. Financial help: The Feed-in Tariff for generating electricity and the Renewable Heating Incentive are discussed on our domestic grants page. There is a short list of links to other useful websites at the bottom of this page. WARNING: If considering a renewable installation – especially solar hot water or electricity – ensure that both the installer and the equipment are approved. Some dubious firms are pushing overpriced products which do not qualify for government support. Approved installers and equipment are listed on the Microgeneration Certification Scheme website. Houses can be designed to capture more of the sun's energy in a passive way. There are other ways of gaining energy from renewable sources that might be considered for domestic installations in a village such as Blewbury. Wood-burning stoves and boilers are the most traditional, and some of them are now easier to use. Wood-burning boilers are covered by the Renewable Heat Incentive. The Renewable Heat Incentive also covers wood-burning stoves, but only if they have a back-boiler. Note that wood-burning boilers are several times more expensive than gas or oil boilers, and they are only really green if the wood is locally sourced. Solar thermal panels are the least expensive of the more modern solutions. The panels can typically supply more than half of the household's hot water needs over the year. Ideally you need a south-facing roof, or one that faces south-east or south-west. East or west-facing can also work, using a larger panel area to compensate for reduced efficiency. A boiler or immersion heater is needed to provide hot water in winter, and to make the water hotter on very dull days. Most conventional boiler and hot-water tank systems are compatible. You will usually need to replace the existing tank with a larger one equipped with a solar heating coil. But if you have a combination (‘combi’) boiler and you don’t currently have a hot water tank, a solar hot water system is probably not compatible without major changes. Solar thermal is a good option, especially if a lot of hot water is used, and it is eligible forthe Renewable Heat Incentive. Solar photovoltaic cells are more expensive but generate electrical energy, which is more valuable than the hot water generated by solar thermal panels. All the electricity from solar cells can be used regardless of the size of the array, while the benefit of solar thermal panels is limited to the hot water requirements of the household. An unshaded south-facing roof is ideal; one that faces south-east, south-west, or even east or west is less efficient but can still be useful. The Feed-in Tariff pays for all electricity, even that used locally, plus a bit more for electricity exported to the grid. Although the Feed-in Tariff is now much less generous than when it began, part of the decrease is offset by much lower prices for solar panels. Heat pumps may be viable in some cases. Ground-source pumps may require disruption of the garden. As heat pumps are better suited to relatively low-temperature underfloor heating, they are easiest to implement in new houses where they are designed in and there is good insulation. Heat pumps are an appealing option under the Renewable Heat Incentive. Combined heat and power plants may not seem as ecologically friendly as the direct use of solar energy, but they generate electrical energy with less waste of energy than conventional power stations because the ‘waste’ heat is also used. Thus they can save carbon dioxide emissions. They have the potential to be more widely used. Although not yet an economic option for domestic installations, there is a pilot programme under the Feed-in Tariff which may change that. Small wind turbines are appropriate in some locations. Although subsidised under the Feed-in Tariff, their use in Blewbury is not attractive because of low average wind speeds, often reduced further due to screening by trees – the energy available depends on the cube of the wind speed. There are also serious planning restrictions. Any viable wind turbine would need to be high on the downs. Water turbines depend on the flow of water and the distance it falls to drive the turbine. The only places where generating electricity for a domestic property from such a turbine might be viable is where there used to be water mills. Even there the energy that could be generated, for example by the Millbrook in Blewbury, is quite low. Small-scale hydropower is included in the Feed-in Tariff. On a larger scale, there are hydroelectric projects near Blewbury on the River Thames at Osney Lock, Sandford Lock and Goring Weir – see below. In the UK, the most common option for small-scale electrical generation which is not needed immediately is to export it to the grid. Other possibilities are to charge batteries or heat water. A wide variety of other ways of storing energy are not viable for small installations. * Solar thermal and solar photovoltaic installations, and to a lesser extent wood-burning boilers and heat pumps, are likely to be the best options for domestic renewable energy generation for houses in Blewbury at present. The Feed-in Tariff pays different rates for different types of system. The overall picture was generous at first – most notably because unlike such tariffs in other countries it pays for all the electricity generated, not just what is exported to the grid. The highest rate, for solar photovoltaic systems installed before April 2012 on existing houses, is now 46.81p per kilowatt-hour (kWh) but new systems only get 15.44p per kWh. However, the Feed-in Tariff for new photovoltaic systems now pays 4.64p per kWh (a bit more than for older systems) for exported electricity on top of the generation tariff. Renewable heating technologies are covered by the Renewable Heat Incentive, which started up for domestic properties in spring 2014 but covers systems installed from July 2009. The Green Deal is no longer available. This section covers the options for the generation of energy from renewable sources on a domestic scale. Stand-alone stoves providing space heating for a room. Generally they are 6–12 kW in output, and some models can be fitted with a back-boiler to provide water heating for hot water and/or radiators. Boilers connected to central heating and hot water systems. These are generally larger than 15 kW. Log boilers cost several times more than conventional gas or oil boilers, and wood pellet boilers are even more expensive to buy. Boilers can be subsidised under the Renewable Heat Initiative. Stoves with a back-boiler to provide central heating are also covered, but stoves without a back-boiler and open fires are not. The concerns about stoves include difficulty of monitoring the output, possible use of non-renewable fuels (e.g. coal), and air pollution – wood smoke from a dirty stove may be carcinogenic. Wood requires more space for storage than other fuels. Obviously, it is necessary to obtain the wood and have room to store it. The fuel options for domestic use are logs, wood chips or wood pellets. It is important to avoid burning painted wood, chipboard or other processed timber as these give off noxious gases. Log fires are attractive but labour intensive. The work required can be minimised by using the fire to heat a large quantity of water, which then supplies the heat required for the dwelling. Wood chips can be produced fairly easily from wood. Their advantage over logs is that they can be fed automatically into the boiler. Wood pellets provide a consistent fuel, with a price per kilowatt similar to that of mains gas. They can be used in automatic boilers which take fuel from a hopper, and only require the ash removed every few days, or in some cases a few times a year. (Some systems also need to have soot cleared from tubes, which can be difficult.) Pellets provide more energy per unit weight than wood chips or logs, partly because they have been dried to reduce the water content. This is typically 8% against the 22% or so normal for untreated wood. Wood is still a fairly rare choice for heating, so it is important to arrange for supply before committing to it for fuel. If you are using wood because of its green credentials it should come from a sustainable source rather than, for example, virgin forest. It is also desirable to ensure that the wood does not have to be transported too far. Wood pellets are common in Scandinavia and the USA, but they are rarer in the UK. Recently quite a lot of wood has been imported from the USA, but that largely nullifies its renewable credentials due to the transport emissions. Logpile provides a list of British suppliers, but some of these import their supplies. There is a lot of useful information and a list of local suppliers on the Oxfordshire Community Woodfuel Programme (Oxlogs) website. Although wood for burning is competitive in cost with other fuels such as oil and gas for the same heat output, boilers are substantially more expensive. Home Sources provide a list of stove suppliers. A useful device to improve the performance of a wood stove is the Caframo Ecofan. It uses the heat of the top surface of the stove (which must be flat) to generate electricity which runs a fan, circulating warm air more evenly within a room and, if the door is left open, into adjoining rooms. This improves comfort and saves fuel. No batteries or mains power are needed. There are also models for stoves burning other fuels. * Wood stoves and boilers can be a good alternative to fossil fuels, provided you can afford the very high boiler cost, store the fuel and manage the extra work. The running costs are likely to be similar to those of fossil fuels. However, it is important to establish a reliable and renewable source, ideally local, for the fuel chosen. Wood-burning boilers, and stoves with back-boilers, are subsidised under the Renewable Heat Incentive. Two roof-mounted solar hot water installations in Blewbury: flat-plate collectors at left, evacuated tubes at right. 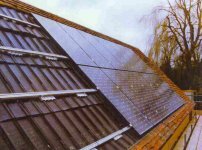 Solar thermal panels are panels facing the sun which heat water, almost always for domestic hot water. When the panels are hot enough, water or another fluid is pumped through them and then through a coil in a hot water tank*. Installations can provide nearly all of the hot water in summer (except on the greyest days), and contribute to water heating during the rest of the year. By storing the hot water in a large, insulated tank, so it can be used at night or the following day, the system provides a way to store solar energy. Note that these systems are not practical for central heating in the UK as the panels do little in winter. * A few systems heat the water directly, without a separate loop and coil in the tank. These require a vented header tank and mitigation against limescale. 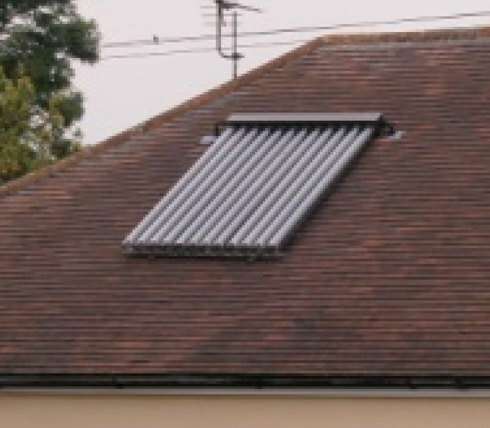 There are two main varieties of solar thermal panels being installed on houses at present. Evacuated tubes are the most efficient (45–50%). However, the alternative flat plate panels tend to be less expensive, possibly more reliable, and a larger area of flat plates with lower efficiency (35–40%) may be preferable if roof space allows. 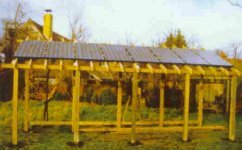 In Oxfordshire the solar energy falling on a square metre of roof, facing south and angled at 30 degrees, is about 1100 kWh per year. A typical dwelling uses perhaps 2500–3500 kWh a year for water heating. Four square metres of solar panels, without any screening from trees or other obstacles, would receive about 4400 kWh of solar energy. It is difficult to capture more than 35–45% of this usefully because of the heat collection efficiency of the panels, heat loss from the storage tank, and the fact that in summer some of the heat will be produced when it is not needed. If the solar panels must face east or west, a larger area of solar thermal panels is needed for the same effect. Under the Renewable Heat Incentive there is an annual subsidy for seven years. The cost of an installation in a modern house with a normal boiler and no significant plumbing problems is likely to be £3000–£4000 for a commercially installed system. Standard solar thermal panels do not normally need planning permission. However, permission is needed for all installations on listed buildings, and is also needed within a conservation area if visible from a public road or path. Always check with the Vale of White Horse planning department for such installations. Solar heating is also used for warming swimming pools. This requires less costly solar thermal panels as the output temperature required is lower. * Where the building and site make them practical, solar thermal panels provide an effective way of saving carbon dioxide in supplying domestic hot water. Under the Renewable Heat Incentive they are a reasonable investment. Solar photovoltaic (PV) systems, or solar cells, convert the energy of sunlight into electricity. The output of each cell is a low-voltage direct current, but this is usually converted by a device called an inverter into 240 volt alternating current to supplement the electricity mains. 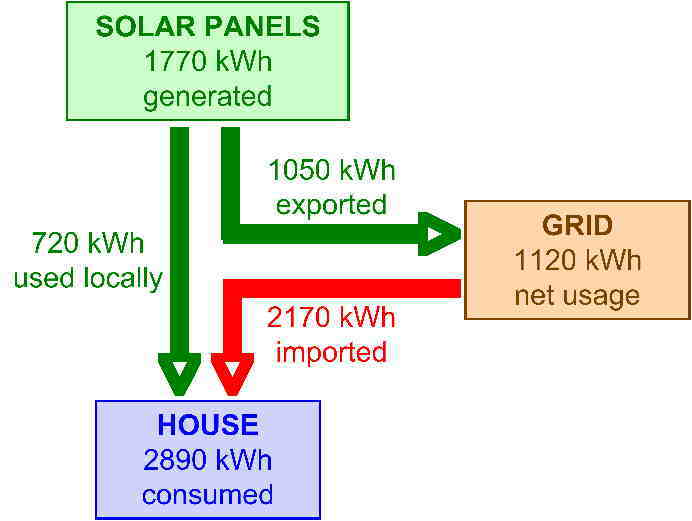 Since domestic demand for electricity does not usually match periods of bright sunshine, in the UK surplus electricity not needed in the building is typically fed into the grid rather than trying to store it locally. An export meter enables payment for this. Solar cells are provided in panels which ideally should be mounted at about a 30–35 degree angle facing south, south-east or south-west, ideally with no shading by trees or other buildings. Photovoltaic cells are less efficient in extracting solar energy than thermal panels. The current silicon-based cells have a theoretical maximum efficiency of about 28%, partly because they only extract energy from part of the sun's spectrum. Practical efficiencies at present are about 12.5–18%, so the area covered needs to be about three times that of thermal panels collecting the same amount of useful energy. In the past, domestic PV installations were harder to justify on strictly financial grounds than solar thermal systems. But nowadays the Feed-in Tariff pays a subsidy that has changed this. The justification is that the energy generated is electrical, which is more valuable than heat. Also note that a PV installation does not need a pump or special plumbing, and so is likely to need little maintenance. A domestic-sized solar PV installation might be rated to generate from 1 to 4 kilowatts of energy in full summer sun of 1000 watts per sq. metre; this rating is called kilowatts-peak, or kWp. This typically requires about 7–8 sq. metres of solar cells per kilowatt. On an open south-facing location in Britain a 1.8 kWp installation is officially estimated to collect on average 1440 kWh a year. However, since Oxfordshire is relatively sunny and southern a local installation company estimates 1710 kWh per year in Blewbury and in some years this has been exceeded (up to 1770 kWh). Solar panels have dropped greatly in price, and even including scaffolding, wiring and electronics prices have come down. Results from a full year of generation at the house mentioned above, which has two people living in it, are shown in the diagram at right. More than half the locally generated electricity, 1050 kWh, was exported to the grid, and 2170 kWh was imported. The 720 kWh generated and used locally saves about £100. Under the Feed-in Tariff the household would receive (for a new system) 15.4 pence per kWh for its entire generation of 1770 kWh, making £273. In addition, the 1050 kWh exported would receive a further 4.6 pence per kWh, or £48. Thus the total of electricity savings and subsidy would be about £420 per year. A household with more people in it, and perhaps less frugal in its electricity usage, would export less but this makes little difference. Note that the tariff rates for new systems will be reduced periodically, depending on sales and costs of PV systems. Once installed and registered, systems receive a guaranteed rate, indexed for inflation, for 20 (formerly 25) years. A solar PV system will have a lifetime of perhaps 25 years. Solar cells use considerable energy to make, so in the UK they need to be run for about 3–5 years before they have generated the energy used in their construction. However, thereafter they are benefiting the environment. * Where the building and site make them practical, solar photovoltaic cells provide an effective way of saving carbon dioxide in generating electricity. Under the Feed-in Tariff they can also be a reasonable investment. Wind turbines extract energy from the wind and are normally designed to generate electricity. However, similar devices are also used for pumping water, and for the direct generation of hot water. With small devices a fairly high wind speed is required for electricity generation applications. They are thus most suitable for remote, fairly windy locations free of trees and nearby buildings. Small wind turbines to generate electricity for household use might generate between 1 and 3 kilowatts at maximum. They cost from £3000 to £10,000 and require regular maintenance. Average wind speeds in central England are lower than in the rest of the United Kingdom, and Blewbury is in a location sheltered by trees, and by the downs in the south. The lower wind speed is particularly important as the energy available increases as the cube of the wind speed. Thus the energy available from a wind installation is likely to be a third of that provided by the same installation in open country elsewhere in the UK, and an eighth of that available on a windy hill or ridge. Wind turbines work best in a steady breeze. If a small turbine is mounted on a roof, the turbulence generated by the roof may significantly reduce the power available, vibration can lead to structural problems, and there may be problems with noise. The need for occasional access to the turbine for servicing should also be considered. In some cases the turbine will generate an unacceptable flicker with the sun in some directions. * It is unlikely that a wind turbine, even if given planning permission, would be a sensible investment in a Blewbury village garden or roof. Water power has been used for over a thousand years for milling grain, but recently has fallen into disuse. Now water turbines can be used to generate electricity provided there is a suitable flow and head of water. The energy available from water flowing at 1 cubic metre a second through a head of 1 metre is about 10 kW. As the system cannot be 100% efficient a more typical output would be 5–7 kW. Systems are likely to be most viable if the energy available is much larger than this, say 50 kW. This either requires the high heads available in mountainous areas or large flows from rivers. As both kinds of site require sensitive treatment, systems are usually individually designed and require official approval, for example from the Environment Agency. As a result, such installations take a long time and are expensive to develop. Near Blewbury, there are community-owned non-profit projects, financed by local share issues, at Osney Lock in Oxford (one Archimedes screw producing 49 kW maximum, now operating – picture at right), Sandford Lock (three Archimedes screws producing 450 kW maximum, approved) and Goring-on-Thames (three Archimedes screws producing 265 kW maximum, planned). Unfortunately, the project for Abingdon Lock had to be cancelled due to reductions in support. Many mills, like those that existed in Blewbury, were on streams with a smaller flow and only a limited head. The Millbrook leaving Blewbury carries water which fell as rain over perhaps 10 sq. km. With a rainfall of 600 mm a year, and allowing for evaporation, the average flow may be around 100 litres per second. It gathers into a single stream at the edge of the Thames flood plain and then falls about 8 metres over 3 miles. Small turbines are not as efficient as large ones. If a turbine could capture the whole flow with a drop of 2 metres it might generate on average around 1 kW. The cost for such an installation depends significantly on the work required to manage the water at the specific site. The system would also require ongoing attention to clear blockages. It is unlikely that a 1 kW system could be justified financially. The number of places where small water turbines might possibly be installed in or near Blewbury are much fewer than for alternative renewable energy options. Small-scale hydro systems are eligible for support under the Feed-in Tariff. * It is unlikely that a water turbine would be a sensible investment in a Blewbury mill as the energy available is too low. Generating electricity at sites where there are larger flows and greater heads of water is more viable. This section covers some options for increasing the effectiveness of the energy used in the home. The design of a house or extension makes a significant difference to its energy efficiency. Good insulation is now required. Designs can capture more of the sun's energy through appropriate south-facing windows. More complex schemes arrange that air carries heat from warmer areas, for example under tiles on a south-facing roof, to other parts of the building. Domestic combined heat and power (CHP) installations use a conventional fuel – normally mains gas – to generate electricity and also to supply heating and hot water. While the efficiency of electrical generation does not approach that of a large power station, the fact that the heat is also used to generate electricity means that overall the domestic installation would use the fossil fuel more effectively. The output would be complementary to solar electricity since peak domestic CHP output would be on winter evenings, unlike solar which works best in summer and only in daylight. The design aim of a domestic CHP unit is to replace a conventional gas boiler, and to require no special installation skills. The electricity generated reduces the demand from the mains, and feeds electricity back into the mains when it is not needed in the house. This requires an export meter. The Feed-in Tariff includes a pilot to subsidise electricity generation by up to 30,000 micro-CHP systems, each rated at up to 2 kW of electricity. Currently, leading contenders for CHP systems are Baxi, E-ON, and Honda. 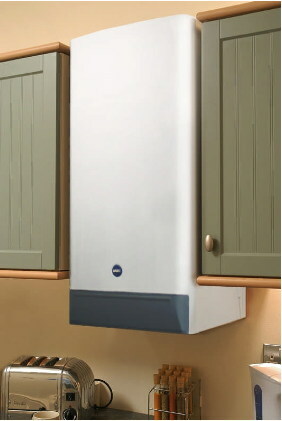 Baxi are now selling the Ecogen (photo) through British Gas. It is designed to look like and easily replace a normal gas boiler, and has a thermal output of 24 kW. It also generates 1.1 kW of electricity using a free-piston Stirling engine (external combustion). The overall efficiency is said to be 92%. It is claimed to produce around 1800–2400 kWh per year. The cost is likely to be around £5000. The Ecogen does create carbon dioxide, but by producing both electricity and heat it is claimed to reduce the carbon footprint of a typical home by at least one tonne a year. Baxi estimates that under the Feed-in Tariff (see above), combined with savings on electricity imported from the grid, typical users could expect to save around £350–£400 a year on their energy bills. It will be interesting to see the Ecogen's performance, cost and payback time in actual use. The Honda Micro CHP generates 1 kW of electricity and 3 kW of heat. The efficiency claimed is 85%. 15,000 of these units have been installed in Japan. The amount of heat is small for most UK houses, and so a top-up heating unit would be required. CHP units work best when they run for long periods, so this combination of a CHP installation sized to match normal heating requirements with a more rarely used conventional boiler could be sensible. The installed cost is said to be about £5600, which means that it would not be an economic choice. At present it is not on sale in the UK. A major advantage of such systems could be that they can continue to power essential services such as freezers and a few lights if there is a power cut. This requires special design features, because for safety reasons such systems must not put voltage on the mains if the mains fails. The most appropriate comparison for a CHP system would be with a modern condensing boiler. With a typical condensing boiler about 88% of the energy in the incoming gas is converted to the energy in the heated water. If the CHP system does not reach a similar efficiency the benefit of generating some of the output as electricity does not compensate for the poorer performance. CHP installations can be sensible for factories, large offices or whole estates. CHP for domestic installations is less attractive, partly because the technology for domestic use is only just becoming available. The industry is represented by the Combined Heat and Power Association. * Domestic CHP is potentially a very significant development. If such units become available in a suitable range of sizes, at reasonable prices, and with efficiencies similar to that of condensing boilers they could become a normal installation for central heating. However, the few models currently available are expensive – it will be interesting to see how the first domestic-size units widely on sale in the UK perform. Heat pumps act as refrigerators in reverse, cooling the outside air or ground while heating the house. The advantage is that, particularly if only a modest temperature is required, the amount of heat supplied can be more than 3 times greater than the electrical energy used to run the system. Some installations can also be used to cool the house during the summer, though this uses some of the energy that might have been saved during the winter. Heat pumps of various types (ground-source, air-source, the less common water-source, and even geothermal heating) are included in the Renewable Heat Incentive, but their use for cooling is specifically excluded. Ground-source heat pumps extract the heat from underground, while air-source heat pumps cool outside air using fan-assisted radiators like the more widely available air conditioning units. The ground outside the house requires a network of pipes, with about 10 metres of pipe per kilowatt required. This can be achieved either by burying the pipes horizontally at perhaps 1.5 to 2 metres below the surface, or by using a deep vertical bore hole. A typical 8 kW system using a trench costs £7000–£10,000 plus the price of the heat distribution system. This can vary with property and location. If it is necessary for reasons of space to dig a borehole then the cost will be substantially higher. There is more information here. There are two types of air-source heating systems. Air-to-air systems provide warm air, which is circulated to heat the building. The other type, air-to-water, heats water to provide heating to a building through radiators or an underfloor system. Air-to-air pumps are not covered by the Renewable Heat Incentive but air-to-water pumps are. A typical 6 kW system costs £8000–£11,000, but unlike ground-source heat pumps there are no additional costs for the heat collection system. An air-source heat pump is obviously only feasible where there is a suitable place to put the unit. There is more information here. 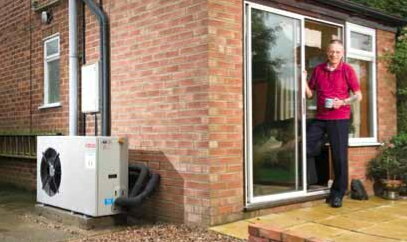 We have a document with specific advice on choosing an air-source heat-pump system and installer here (pdf). It covers type of refrigerant, hot water production, defrost cycle, coefficient of performance vs. seasonal performance factor, balancing under-floor heating, and installer requirements. Heat pumps are more efficient for heating the warm water used in underfloor heating than the very hot water used in the more common heating systems using radiators. Therefore the most likely application of heat pumps is for new houses with high-quality insulation specifically designed to use them. Where mains gas is available for heating, a heat pump may be a marginal economic choice as the efficiency gains only cancel out the higher price of electricity. There is a bigger advantage when the house is not on gas and uses oil, coal or electricity for heating. The Renewable Heat Incentive alters the balance to make heat pumps a better investment. Heat pumps should also save about half the greenhouse gases generated by alternative forms of heating such as gas. The carbon dioxide generated per unit of electricity in the UK is estimated to be about twice that of the same heat energy generated from gas, and a good heat pump system can generate more than three units of heat energy for each unit of electricity used. A field study by the Energy Saving Trust showed that although heat pumps can work well, many systems did not perform as efficiently as they should. The UK situation is worse than in other countries that use heat pumps more widely. Most of the problem seemed to be due to faulty or badly designed installations, or to confusing controls. * The best role for heat pumps is in supplying warm water, typically for underfloor heating, to new developments. Subsidies and the resulting lower prices of the equipment may turn them into an attractive option. Otherwise, the advantage in investing in a heat pump is in saving greenhouse gases. Green energy may be generated at a time when there is no domestic use for it. If it is not to be wasted it should be exported to the grid, or stored. This section covers the options for the storage of locally generated energy – for large-scale renewable sources see our green energy page. If the energy for hot water is to be obtained by a daily collection of solar energy, the storage tank must be able to hold enough water for all normal uses between say 5 pm and 10 am. The normal water usage in the Thames valley is about 168 litres per person a day – a bath may use about 80 litres of water, a 3 minute shower might use 50 litres. Washing up by hand can use 25 litres. About a third of all water usage is of hot water – say 220 litres a day for a four person household. Hot water tanks typically hold 100–300 litres. 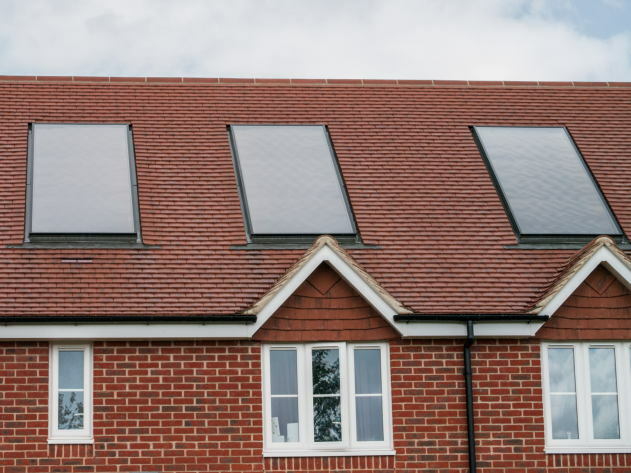 Solar thermal systems will normally be sized so that they can meet the normal requirements for hot water over the course of a day for six to eight months each the year. A large hot water tank of diameter 50 cm and height 120 cm holds about 235 litres of water. To heat this volume of water to 60 degrees Celsius from a cold water supply at 10 degrees takes about 13.5 kWh. To generate this in a normal summer day, solar panels occupying at least 4 sq. metres are desirable. Doubling the area of panels would have no benefit on many summer days, but would help in autumn or spring. If the tank is insulated by 75 mm of foam with a U value of 0.1, a further 1.5 kWh of energy may be lost by convection each day. This would cool the tank by about 4 degrees overnight. Thicker insulation would be an advantage. It is very desirable that the supply of hot water should use the locally generated heat when it is available. This should be as automatic as possible, without people having to remember to switch off conventional water heaters when solar energy is available. For most of the year, even if the solar panels do not heat the water fully they provide some pre-heating. The extra heating from solar panels is largely wasted if the conventional heating were to come on in the morning if the hot water tank is not hot enough. The usual arrangement is to have a single large tank with two or three kinds of heating: one coil from solar panels, one from a boiler, and an electric immersion heater. Heating from the boiler or immersion heater can be controlled to run only in the evening. A common arrangement is that the boiler or immersion heater only heat the top part of the tank, while the solar heating is controlled by a sensor at the very bottom and therefore heats more water. A system can be configured to try to store enough hot water to support two days' usage. This allows continuing use of solar energy for hot water if a sunny day is followed by a cloudy one. This would be a more expensive system with a larger area of solar panels and a larger hot water tank. * Storing solar energy as hot water is a practical option for the hot water usage of a dwelling. A separate, larger hot water tank could be used to store Economy 7 electricity to drive a flexible central heating system, but a gas boiler without storage is usually a better solution. It might be thought that Economy 7 electricity generates less carbon dioxide than the direct use of gas, because of the greater proportion of nuclear and renewable energy in the electricity used at night. However, the overnight consumption of electricity in England currently far exceeds the available nuclear and renewable generation capacity, so any additional load would be supplied by fossil fuel power stations. The carbon dioxide produced by these for each kWh of useful heating far exceeds that from the direct use of gas. The use of hot water to store energy from other sources such as wind turbines fails to attract because the other energy sources are not viable. Electrical energy can be stored in rechargeable batteries and used later, converted to supplement the mains supply. Special batteries are available designed for the storage of solar or wind generated energy, but their general characteristics are similar to those of a conventional car battery, which can hold about 0.5 kWh. Batteries will only return a proportion of the energy used to charge them. The proportion depends on the charging and discharging rates and the depth of discharge, but it is difficult to achieve more than 80% efficiency. Batteries will only last a limited number of charge/discharge cycles. For the fairly deep discharge cycles likely in this kind of application this might be around 400 cycles. If so the cost of the battery must be spread over the storage of 200 kWh. This is likely to be too high to be viable. For example a new Trojan deep cycle battery L16H intended for this purpose holds about 3 kWh and the makers state it can supply 1004 kWh during its life. This costs about £220, making the battery cost per kWh 22 pence. In addition, end-of-life disposal of batteries is a significant environmental problem. For greatest efficiency and lifetime batteries should be charged and discharged fairly slowly, e.g. over a period of 10 hours. Heavy short-term loads such as electric showers and clothes dryers should be met from the grid. This can be achieved by limiting the maximum energy output from the batteries. It is not sensible for a battery to feed electricity into the grid at times of low demand, so a sensor of the metered electricity input is required. A practical installation might use 20 batteries able to hold say 8 kWh of electrical energy. These would be able to accept the full output of a 1 kW generator such as a solar cell panel or wind turbine. On an average day such a generator might provide a total of 8 kWh, and the system might then be able to replace about half the 12 kWh electrical energy used by a typical household. Any system able to feed the grid must switch off if the mains is not present. This is to protect engineers working on the public lines. Thus such systems do not normally provide backup power for mains failure. Battery storage may also be used to accept energy from the mains on a low overnight tariff and return it during the day. This is used in Japan, where there is a large difference between the two tariffs. It is less viable in the UK, where the tariff reduction is about 50% and part of the benefit of this is lost during the storage process. This process of smoothing demand has some environmental benefits as the power stations providing the base load at night are typically more efficient, or use nuclear fuel. * Battery storage does not seem likely to be an effective or economic method of storing energy domestically. Systems are available for storing energy in a variety of other ways. However, at present none is competitive in small installations. We cover storage of energy from large-scale renewable sources (many of which are intermittent) on our green energy page. Energy can be stored as hydrogen by electrolysing water. With a suitable system the hydrogen could be created at high pressure, avoiding the need to compress it to minimise the volume needed to store it. If atmospheric pressure storage was used, an ability to store about 5 cubic metres of hydrogen would be needed to deliver 10 kWh. The hydrogen could be converted back into electricity when required using a fuel cell. This is the most promising of the alternative solutions and is beginning to be employed in demonstration systems, for example in a house relying entirely on solar photovoltaic energy. Energy can be stored by raising water to a high reservoir, and allowing the energy to be released through a turbine when is needed. This is used very effectively in large scale pumped-storage power stations, but the concept does not scale down well. If a domestic installation pumped water between two reservoirs each 1 metre cube, with a vertical separation of 10 metres, the maximum energy stored would be 0.03 kWh worth perhaps 0.4 pence. A more dramatic installation might imagine a reservoir on Churn Hill of say 10 x 10 x 10 metres, capable of holding 1000 tonnes of water, connected to a similar reservoir 50 metres lower down. This installation would be able to store a potential energy 5000 times greater than the domestic option or 150 kWh. Such a system might act as the backup storage for a wind turbine or solar cell installation rated at 15 kW, and the combination might meet most of the electrical needs of 10 houses. However it would be very expensive to build and maintain. A system that fed the excess energy back to the mains would be much less expensive and more efficient. Another way of storing energy is in the rotation of a flywheel. Existing flywheel technology can store energy for a year or more. See for example the Active Power company. Compared with batteries, the materials used are more benign, the power extracted is closer to the power stored, and the system does not deteriorate after a limited number of cycles. However a flywheel installation with the same energy storage as a normal car battery is expensive and weighs a quarter of a tonne. Utilities can store energy as compressed air in airtight underground caverns. When required the air expands through a turbine to create electricity. The decisive problem with much smaller systems is the limited power that can be generated. A container holding a cubic metre of air at 100 atmospheres would only have a potential energy of about 0.1 kWh, worth about 1 penny. Supercapacitors can store a modest amount of electrical energy very efficiently in enhanced versions of standard electronic components. They can provide very large bursts of power. Their ideal application is as a means of providing bursts of energy for road vehicles when overtaking or climbing hills, thus allowing the main engine to be sized for the normal load, making it more efficient. However they are not appropriate for storing the energy needed in domestic installations. Storage of energy in superconducting magnetic fields is practicable for power utilities, aiming to improve the stability of supplies with rapidly varying loads. However, introducing very large magnetic fields and cryogenic temperatures into a domestic installation would be as unwelcome as it is impractical. TV Energy page on renewable energy sources provides more information on the technologies. Office of Gas and Electricity Markets (OFGEM) is the industry regulator, and will be managing the Feed-in Tariff and Renewable Heat Incentive. Energy Saving Trust has a huge amount of useful information. National Energy Foundation promotes ‘a better use of energy to counter climate change’. The yougen website has very clear descriptions of all the domestic renewable technologies – including pros and cons, lists of installers (some with reviews), and other information.